In this final piece in our 3 part series on setting up an office recycling program we look at optimising waste separation, getting the program off to a strong start, making recycling easy for everyone, and ensuring your efforts bear fruit. One of your top priorities should be to make sure that waste collected for recycling will actually reach its intended destination. Stories of cleaning contractors and building management re-combining recyclables with general waste are rarer now than they once were. Even so, it’s important to make sure everyone handling your waste knows what to do with it and will do what they say. To this end make a point of scheduling periodic checks to ensure your recycling efforts are not in vain. If you’re going the extra distance to collect special, less well-catered-for waste streams, such as food and e-waste, you’ll need to make sure you can arrange appropriate waste collection services. If you’ll be using a recycling contractor, it’s also worth doing some due diligence as to their reliability. Some contractors a lot better than others. A reliable contractor should be happy to pass on the names of a few customers who’ll vouch for the quality of its service. A recycling industry mantra is, “prevent co-mingling of waste streams by separating at source”. 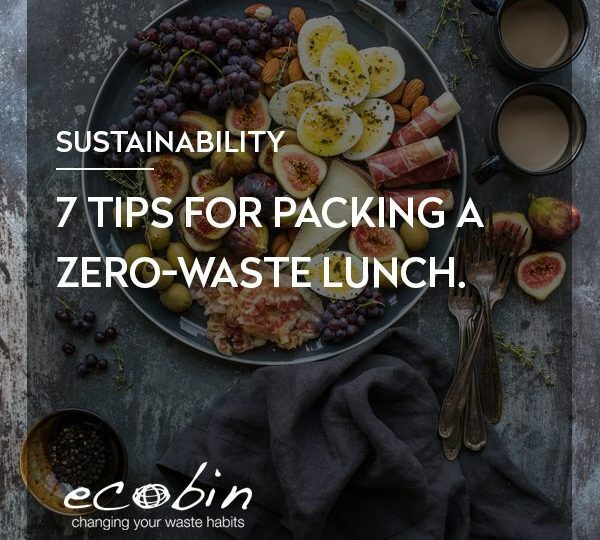 Unless you’re in one of the very few catchment areas that sorts waste by hand, or you want to pay your cleaners to separate it, you’ll need to provide separate bins for each waste stream. Choice of bins, their placement and capacity are all important for efficient separation at source. Each waste stream needs its own clearly labelled bins. Ideally these should be standardised throughout your organisation, too. Make sure that there’s enough recycling bin capacity within easy reach of all staff to handle 80-90% of your waste. 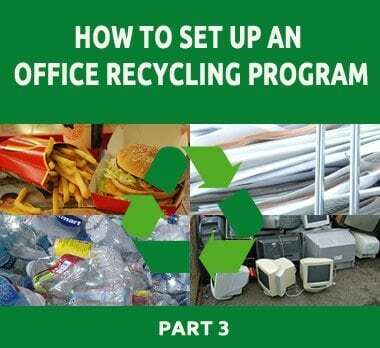 If your office recycles at anywhere near potential, you’ll need to allow that much for recycling. For the same reasons, aim to reduce the allocation of bin capacity for landfill. 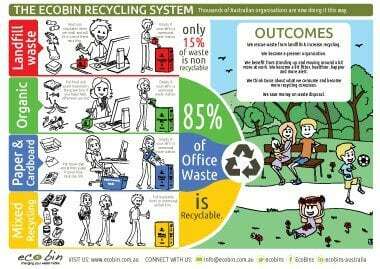 In choosing a recycling bin solution for your office, the cost of bins is an important consideration. In opting for more expensive designs, your budget may limit the number of bins you can afford to buy. In turn, this may mean fewer than the ideal number of collection points. One solution which works well for reducing landfill / general waste is to provide small desktop bins for non-recyclable items. 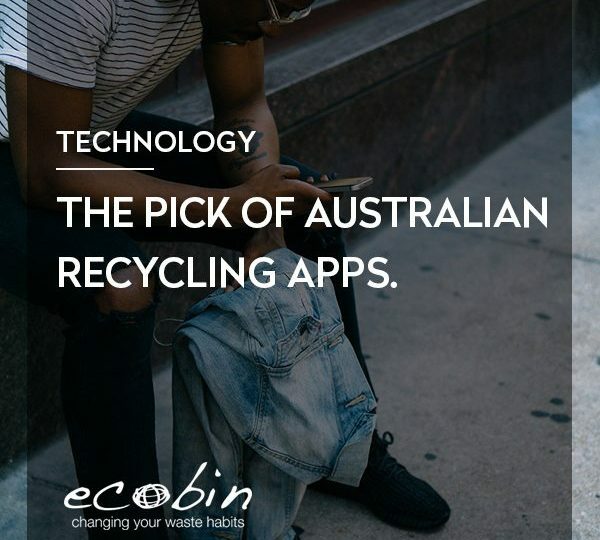 For example, EcoBin makes a 1 litre desktop bin for general waste waste. In practice, a mini bin is ample for a day’s non-recyclable waste output from the average office worker. Not only is it sufficient, it also educates and reminds staff about just how little needs to go to landfill. Besides strategic bin placement, clear, high quality signage and ongoing reminders will go a long way towards helping create an organisation of conscientious recyclers. Colour coding your bins for different waste streams is one of the most reliable forms of signage. Reinforce your colour coding with posters showing which types of item belong in each waste stream. Combined, these measures will give you a system that eliminates all but the most careless or wilful errors. If you’re coordinating any more than a small team, setting a launch date will be preferable to simply swapping your bins and posting up a few signs. Advance notice will raise awareness and create a sense of anticipation. Make several staggered announcements to let staff know you’re launching a recycling program, explaining why, and what you’re aiming to achieve. Research shows that non-recyclers are most easily convinced to change their habits on learning that they’re in the minority as non-recyclers amongst neighbours and peers* . A desire to conform to normal behaviour is a more compelling reason it seems, than one to clean up the planet, save money or simply tackle a new challenge. A simple induction demonstration using sample waste items for each bin type is another useful way to ensure you get off to a good start. This may seem trivial and unnecessary – we all know how to put stuff in bins. Even so, it’s surprisingly easy to forget what goes where, even with a mind free from work issues. Airlines run safety demonstrations on every flight for similar reasons. It’s a lot easier to remember a visual demonstration than verbal or written instructions. Once your new program is underway it’s important to make periodic checks to ensure that it’s working as planned. An annual review is in ideal way to throughly evaluate your efforts with some hard numbers, but it’s also advisable to monitor your waste streams for the first few months after launch. You may not have the time or resources to conduct a full waste audit soon after the launch date, or even every 12 months. However, keeping a tally of the number of bins filled for each waste stream will cost next to nothing. Cleaning or janitorial staff should be able to keep a log book without difficulty. Even if you lose count for a while, it’s easy to re-start the monitoring process. Just like your initial waste audit, you can use data from a sample period to make projections for the month, quarter or year. As a part of your monitoring process make a point of sample checking the contents of recycling bins for non recyclables and general waste bins for recyclables. What do your logs tell you? Are you making headway? 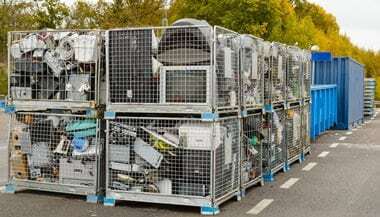 Have you reduced the amount of waste going to landfill? If so, make a point of letting everyone know. Congratulate and thank your team and make sure to let them know how much waste you’re now diverting from landfill to recycling. If things haven’t improved – what’s going wrong? Is there an issue with bin placement? Are staff reluctant to use the new bins? If so – why? Can you pinpoint problem areas? Most issues will come down to either convenience or forgetfulness, which can both be remedied. Periodic reminders about recycling will also help keep everyone on track. Again, choice of message is important. Communications that let everyone know you’re succeeding, reinforcing the idea that the majority is recycling, will be more effective than messages to the effect, “we must do better guys”. Unless something is seriously wrong, your year end review should show a marked reduction in waste going to landfill. Congratulations, and what’s next? Zero Landfill? Zero Waste? Or if you’re feeling less ambitious, how about reducing your total volumes by a manageable amount?